Weekly Happenings: It’s hard to believe that tomorrow will herald in the month of May. The year is almost halfway over…where is it going?! This past week was a little out of the norm for us in that on Monday night we went and purchased a used car (a 2016 Mazda 3) to replace the Honda. Also, San Antonio celebrated Fiesta (a huge multi-day party that includes the Battle of the Flowers parade, which is a parade that honors the heroes of the battles of San Jacinto and the Alamo). Here’s a link that explains a bit about the history of Fiesta. We pretty much avoid downtown during Fiesta-time (it seems like a lot of people use it as an excuse to party hard and it’s just crazy-crowded) but Joseph still got to have a Fiesta party at school, which he enjoyed. This past week also contained Abigail’s four month check-up, which is yet another contributing factor to me wondering where the time is going. The Weekly Weather: Typical spring weather: warm and sunny…though we did have a thunderstorm come through last night which brought with it thunder, lightning, rain, wind, and a bit of hail. Miraculously, both kids slept through it. What Paul’s Been Up To: Work and school, mainly. He did a great job having a firm hand with the car salesman when we were at the dealership so that we didn’t pay sticker price for our new car. He’s enjoying the perks of driving a way newer car (we’re talking a difference of 13 years between the Honda and this Mazda). He also worked on preparing a talk for church today, as well as a lesson for Elders’ Quorum. He’ll have a busy day at church today, for sure. What Sarah’s Been Up To: Mainly a rinse and repeat of last week: keeping the smalls happy and healthy. I did my best to entertain the kids at the dealership since it can be a rather lengthy process (Paul had done as much as he could ahead of time, like pre-approval of a loan and what-not, but it still took several hours). What Abigail’s Been Up To: I just switched out her clothes to the next size up, so she’s now in 6-9/9 month clothes. This came after taking her for her check-up and finding out she is now 16 pounds, 14 ounces and 24 and 3/4 inches long. No wonder her clothes were getting snug! I was a bit worried because she was tugging at one of her ears quite a bit, but the doctor said that it was not infected. She said that it was most likely due to early teething pain (which makes sense when I consider how much Abigail’s been drooling) which radiates up to the ears from the gums. 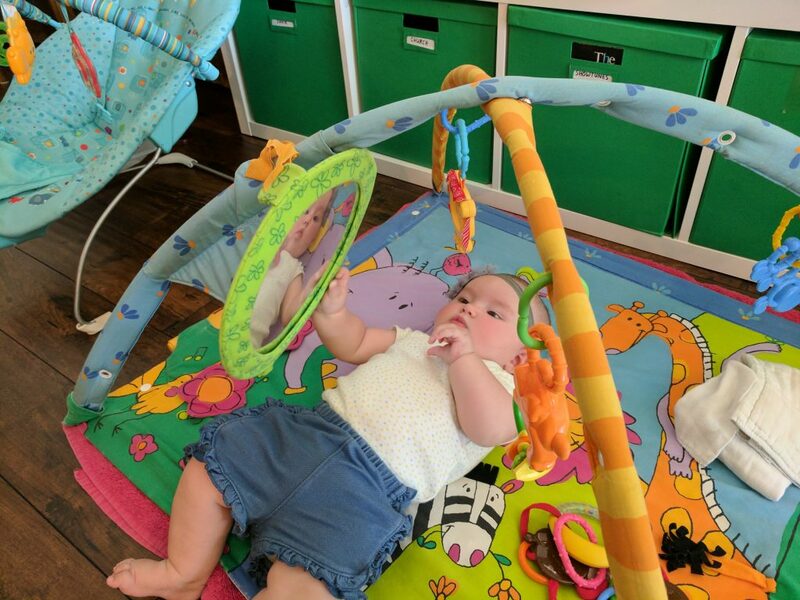 Luckily, she hasn’t been out-of-control fussy so far, since we still probably have quite some time to go before the tooth (or teeth…if she’s like Joseph, she’ll pop out the first two simultaneously) makes an appearance. She also had her first experience with baby oatmeal. She seems to enjoy it (at least what makes it into her mouth), but gets frustrated after a bit and wants a bottle to fill her belly faster. I’m not surprised with this outcome, so we’re taking it slowly and letting her set the pace. Checking out the other “baby”. 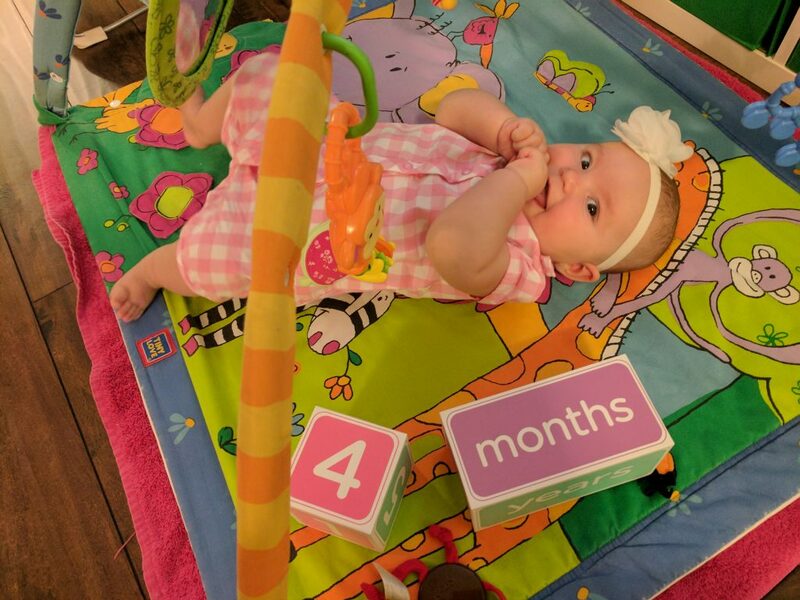 It’s hard to believe this bright-eyed baby is four months old! 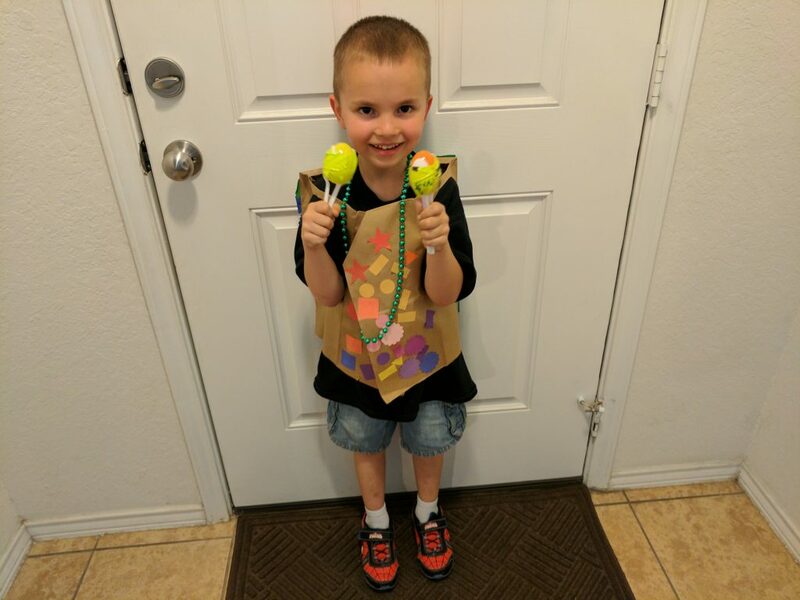 Showing off his Fiesta “vest”, necklace (green, his favorite color), and maracas (made from Easter eggs filled with dried beans, held together by plastic spoons and tape). 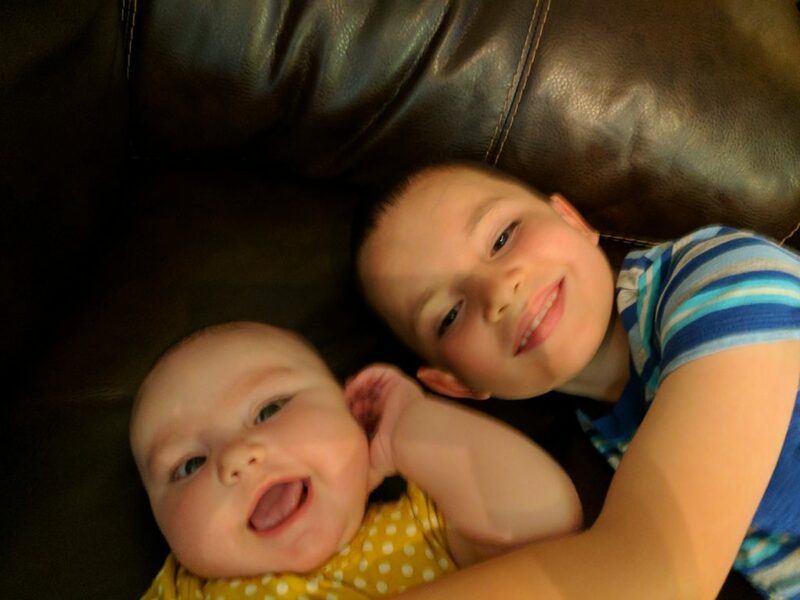 I sure love these two! 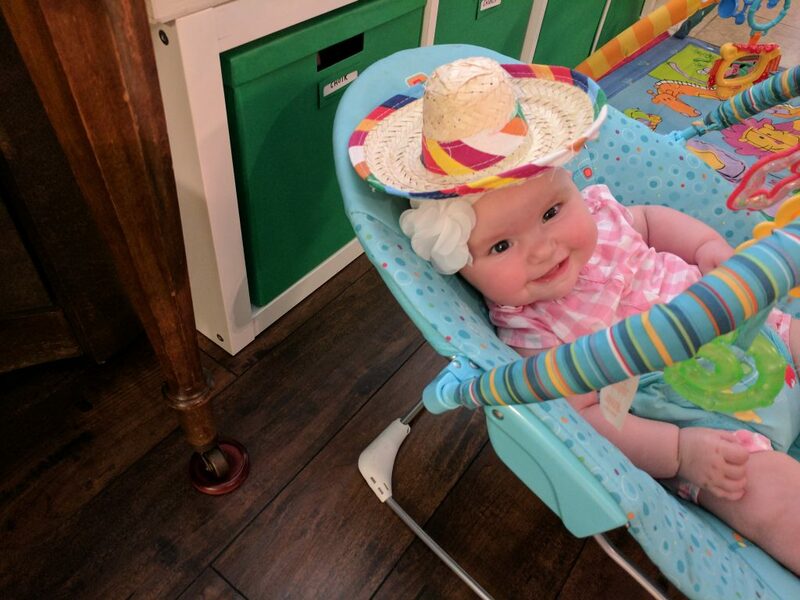 Bonus Video: Abigail having cereal for the first time…messy and entertaining for all, haha.